Race season is so close now I can taste it!!! Or, maybe it’s just the snow I’m catching on my tongue. Either way, it tastes good. 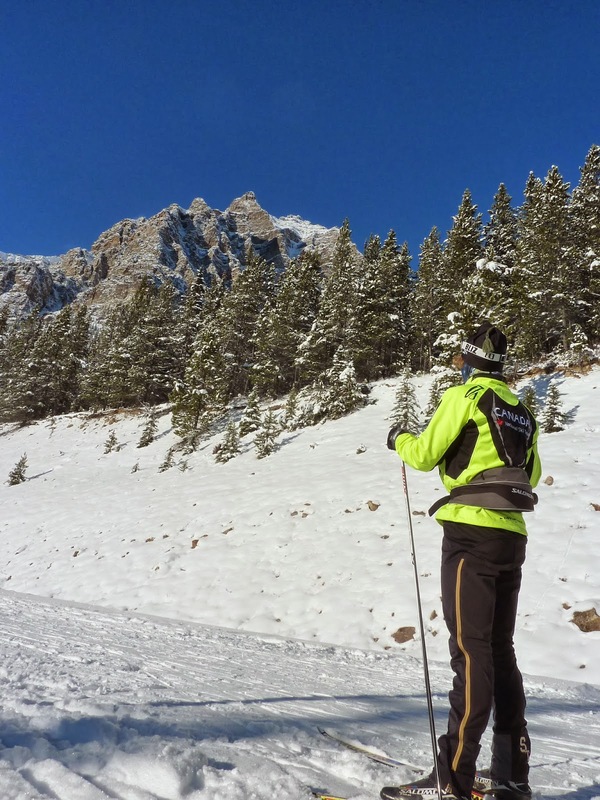 With Winter and ski racing being first and foremost on my mind today (….and…. actually, pretty much everyday), this blog post has two elements–which are kinda given away in the title. If you need colourful visual stimulus to keep you reading stuff, first, good luck with life; second, skip down to the Lake Louise Section of the blog and enjoy. A friend of mine was asking me for ski racing/training tips the other day and one of the tips I came up with for her was about the mindset I carry into a race. These three tips are pretty universal to life, so if you don’t ski race feel free to slot in words pertaining to whatever thing you are currently pursuing, whenever I mention ski racing, and then go out there and keep pursuing it! 1) Today is unique. You will have no other opportunity in your life to race on the given race course, under the given set of conditions, with the given group of competitors. Make the most of the opportunity!!! Go out there, race the best you can and take advantage of and enjoy the situation on the day! 2) Don’t be afraid of failure (I know this one is a bit cliché–but I had to add it). Sometimes you learn more from a failed experience than a successful one. See your mistakes as opportunities to learn! Which brings me to the last, and possibly most important race-philosophy tip…. 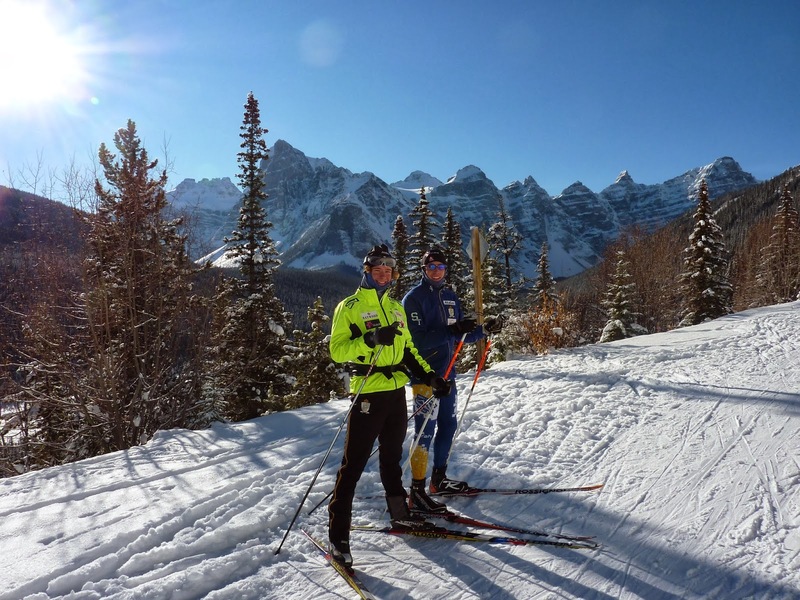 3) Ski racing is an ongoing learning experience. That’s one of the things that makes it so rewarding! Each race experience that you have (and when I say “race experience” I mean time trials too) is an opportunity to learn more about yourself and to learn about what works and what doesn’t work for you to help you perform the best you can. See every race as the fun learning experience that it is and try to take a few things, that will help you be faster in the next race, away from each race that you do. If you can learn something from every race then every race–even the bad ones–will have an element of success in it. To help facilitate this, I keep a race journal. The night before each race I write important things (like start time, warm up routine, goals for the race, etc) in my journal and afterwards I write a review of the race in it. In the review I like to include things that went well, things that I can improve and any other points of interest that I’d like to remember. In my experience, there are few things better than training camps. Of the few things that are better, both “race trips” and “last minute training camps” make the list. So you can imagine my excitement when it was announced, in a very last minute-fashion, that we were to have a training camp this weekend in Lake Louise! Although that excitement quickly changed to stress when I remembered that I had to write a midterm on the Saturday of the camp, the stress has now faded away into the past with the help of the calming effect that both fresh snow and finished midterms have on me. Thankfully, with L.L. only an hour drive from Canmore, I was able to get a ride up to our first on-snow camp of the year when my midterm was done (thanks Val!). Alex and I at the top of Moraine Lake Rd. Thanks to Lars for taking the pictures featured in my blog today! Although Lake Louise doesn’t bump out Silverstar as my top “paradise on earth” ski location, it is really, really nice for early on-snow sessions–especially considering that there was only about 15-20cm of snow on the ground for the duration of the camp. Looking up at what I believe is Mount Temple, the tallest peak in the region. I got a some good workouts in over the course of the 3 days I was there for. For me, there were two really cool stand-outs from the camp. First, there’s the fact that the trail we were skiing up–Moraine Lake Road in the summer (fun fact: Moraine Lake was featured on the 1969-70 Canadian $20 bill)–is primarily made up of a pretty continuous, almost hour-long climb. Of this hour of climbing a large part is a perfect classic striding grade! Made for some nice zone1. 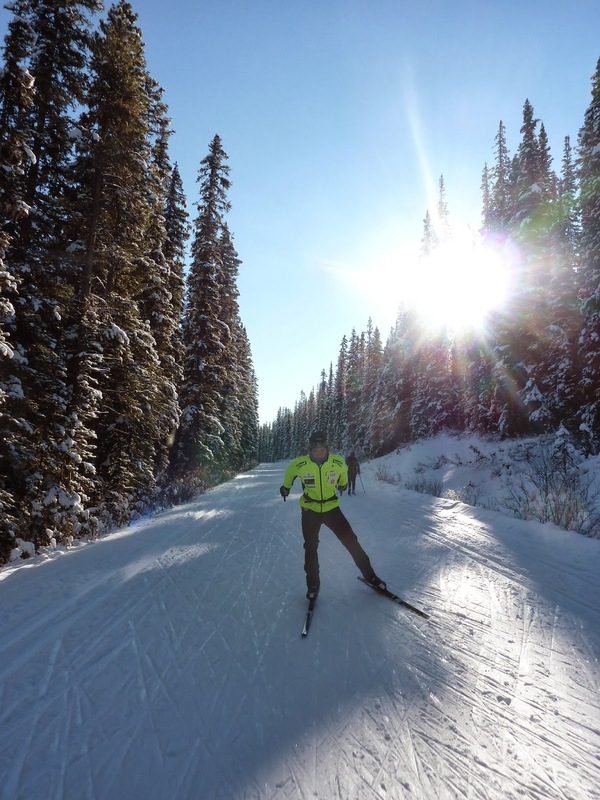 Second, this morning we got to do a really fun/hard skate skiing-speed interval set. One of the harder on-snow interval sets that we’ve had this year–and it went well! Only thing was that the trail was SUPER busy; it made for some interesting mid-interval dodging of other skiers. I actually don’t think I’ve ever seen as many skiers on one trail, in Canada, as there were on Moraine Lake Road every day of the camp. I decided to attribute this to the fact that xc-skiing is growing, as a sport, in North America. Live with it. Nice two skating… gotta get more knee bend.